For the last 40 years, Rain-X has provided drivers with products to help them outsmart the elements. Whether you are purchasing wiper blades for a personal car or an entire fleet, we can help you lower the chatter and the cost. The revolutionary Rain-X Latitude® wiper blade contours to the curvature of your windshield to provide even piping pressure along the full length of the blade. 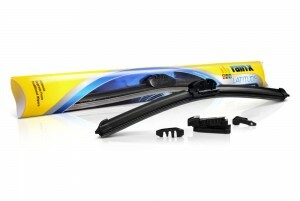 These chatter and streak free wipers have a synthetic squeegee that will withstand extreme weather conditions. Latitude® blades are ideal for consumer use. The Rain-X Weatherbeater® Wiper Blades provide a smooth, clean streak free wipe using embedded friction reducers at multiple pressure points. These durable blades are made with an all-natural squeegee rubber that resists cracking, splitting and tearing caused by heat fluctuations, wiper fluid and salt. Weatherbeater® blades are idea for commercial use. For additional information or to find your perfect blade visit www.rainx.com.